Prof. Nathan Hesselink recently spoke at two universities as a Distinguished Speaker for the Association of Asian Studies Lecture Series and presented talks at two international conferences. He gave the lecture “Korean Drumming and Cosmology: Music Reflecting and Shaping Local Culture" at Mt. Allison University (New Brunswick, Canada) and the University of California-Davis (U.S.A.); and he presented "Cross-Cultural Resonance in the Cadential Hemiola” at the Fifth International Conference on Analytical Approaches to World Music in Thessaloniki, Greece, and "Cultural Legacy, Transmission, and Future Prospects for Gochang Nongak" at the 2018 World Forum for Intangible Cultural Heritage in Jeonju, South Korea. Prof. John Roeder gave three keynote addresses in 2018: at the Analytical Approaches to World Music conference in Thessaloniki, Greece; at the Rocky Mountain Music Scholars conference in Tucson, AZ; and at the Meter Symposium 3 in Sydney, Australia. This summer Prof. Roeder gave lectures at the East China Normal University in Shanghai, and at the 2018 Perspectives on Chinese Contemporary Music Conference, sponsored by the Harvard Shanghai Center. Dr. Ève Poudrier published “Tapping to Carter: Mensural Determinacy in Complex Rhythmic Sequences" in Empirical Musicology Review. The article investigate the influence of style-specific expertise on musicians' ability to find the beat in a passage from Elliott Carter's 90+ for piano (1994). Sessional lecturer Dr. Maria Virginia Acuña received an SSHRC postdoctoral fellowship for her project, “Cultural Transfer in Mid-Eighteenth-Century Spain: The Italian Castrato in Madrid.” With Susan Lewis, she co-authored a book, Claudio Monteverdi: A Research and Information Guide. She also published two peer-reviewed articles: “Love Conquers All: Cupid, Philip V, and the Allegorical Zarzuela during the War of the Spanish Succession (1701–16),” in Eighteenth-Century Music (March 2018), and “Sobbing Cupids, Lamenting Lovers, and Weeping Nymphs in the Early Zarzuela: Calderón de la Barca’s El laurel de Apolo(1657) and Durón and Navas’s Apolo y Dafne (ca. 1700)” in Bulletin of the Comediantes (2017). Harpist and adjunct professor Elizabeth Volpé Bligh published “Cracking the Nutcracker,” a new article in Harp Column about the ballet’s iconic harp part. On Friday, March 16th, UBC President Santa Ono (center, on cello) and students from the School of Music surprised commuters with a pop up concert at Broadway-City Hall SkyTrain station. Thanks to our friends at TransLink for hosting us! Dr. Hedy Law’s essay on the female “citoyenne” in 18th-century French opera — including Sapho (1795) by librettist Constance-Marie de Salm and composer Jean-Paul-Gilles Martini — was published this spring in The Opera Quarterly. This November, Dr. Ève Poudrier presented a talk entitled “The influence of grouping and tempo on subjective metricization” at the Auditory Perception, Cognition, and Action Meeting (APCAM) in Vancouver, British Columbia. The presentation slides are available here. 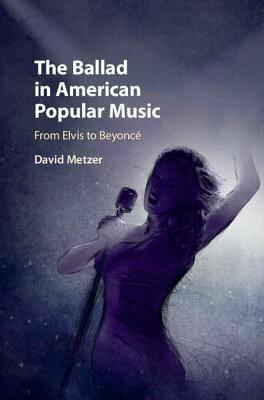 Dr. David Metzer’s new book, The Ballad in American Popular Music: From Elvis to Beyoncé, was published by Cambridge University Press. It is the first history of the ballad in recent popular music. Prof. Metzer chronicles a musical history of the ballad, looking at how such celebrated singers as Frank Sinatra, Aretha Franklin, Barry Manilow, and Whitney Houston have shaped the genre. He also offers a history of emotions in popular culture, showing how ballads capture the changing ways in which feelings have been understood and experienced. You can listen to Prof. Metzer talk about his book on the School of Music podcast. Music theorists and editors Dr. Laurel Parsons (MA ’91, Ph.D ’03) and Dr. Brenda Ravenscroft (Ph.D ’93) won the Society for Music Theory’s 2018 award for the Outstanding Multi-Authored Publication for Analytical Essays on Music by Women Composers: Concert Music, 1960-2000 (Oxford University Press, 2016). It is the first of a four-volume series. Dr. John Roeder gave the keynote address at a conference in London about the operas of Thomas Adès. At the Society for Music Theory annual meeting in November, he also presented papers on music of Chen Yi, and on teaching musical meter. Dr. Nathan Hesselink gave three talks in the past year: "The Backbeat as Expressive Device in Popular Music," presented at the Annual Meeting of the Society for Music Theory in Vancouver; "Korean Drumming and Cosmology: Music Reflecting and Shaping Local Culture," presented at Lewis and Clark College, Portland, Oregon; and "Radiohead’s OK Computer," presented as part of Rain City Chronicles “The Record Club” Series, Macmillan Space Centre, Vancouver. The Korean translation of his first book on Korean folk drumming, P’ungmul: South Korean Drumming and Dance (University of Chicago), was published by the Academy of Korean Studies. The School of Music’s Rhythm Research Cluster hosted its first symposium, "Entrainment and the Human-Technology Interface," in September. UBC faculty, students, and guest lecturers together explored the history and nature of interactions between live human agents (performers and composers) and an externalizing and regulating entraining agent (both metronomes and click tracks). The next symposium, titled "Modeling Rhythmic Complexity," will focus on the cognition and production of complex rhythmic structures (such as polyrhythm and syncopation) using tools and methods from fields as diverse as linguistics, music information retrieval, behavioural psychology and neuroscience. It is scheduled for January 2018. Elizabeth Volpé Bligh published a new article in the November issue of Harp Column. During his first year at UBC, Dr. Claudio Vellutini was invited to present at the conference London Voices, 1820-1840 hosted by King's College London and at the Rossini 2017 Conference organized by the Rossini Foundation in Pesaro, Italy. He also gave a paper at the Second Transnational Opera Studies Conference in Bern, Switzerland. His article "Opera and Monuments: Verdi's Ernani in Vienna and the Construction of Dynastic Memory" has been accepted for publication and is forthcoming in the Cambridge Opera Journal. In Vancouver, he was a guest of the radio programme Place à l'opéra on Radio Canada), and gave pre-concert talks on Verdi's Macbeth and Otello at the Italian Cultural Institute and at the Vancouver Opera Festival. Prof. Stephen Chatman published four new books of sheet music: Shine! shine! shine! from A Song of Joys, Dawn of Night, Forever, Remember Me, and O Clap Your Hands. All are available via Morningstar Music. In May, Dr. Brandon Konoval presented a conference paper for the Canadian Society for the History and Philosophy of Science: "The Disenchanted Flute? Music, Max Weber, and Early Modern Science." He also published an article in Modern Intellectual History: "Between Aristotle and Lucretius: Discourses of Nature and Rousseau's Discours sur l'inégalité." Over the summer, Doctor of Musical Arts student Kristen Cooke received an opportunity of a lifetime. 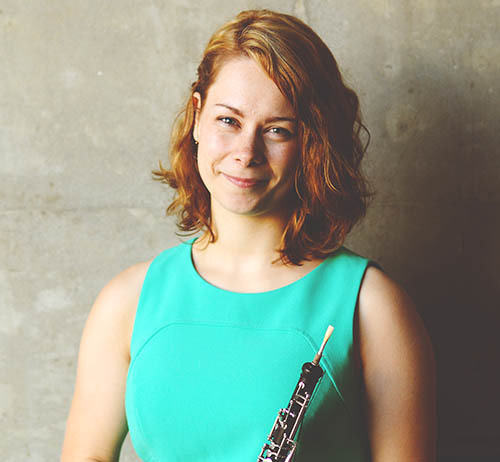 As the first winner of the Royal Over-Seas League UK Scholarship for a BC Emerging Musician, the UBC oboist got a taste of professional music life in the UK, working with British and Commonwealth musicians, and performing at London's Church of St Martin-in-the-Fields, at the Edinburgh Fringe Festival, and British Isles Music Festival. The Royal Over-Seas League (ROSL) has had a long history of supporting and nurturing talent from Commonwealth countries. Along with existing scholarships for aspiring professional musicians from Australia and New Zealand, ROSL has now offered their first musical scholarship in Canada. Each scholarship package includes an incredible itinerary of performing concerts at iconic venues and attending coaching sessions with prominent musicians in London. To top it off, recipients enjoy an all-expenses-paid trip with time to explore. “We are thrilled and grateful that the Royal Over-Seas League has generously offered this opportunity to a UBC student,” said Richard Kurth, director of the UBC School of Music. “ROSL provided Kristen with a wealth of artistic experiences that were wonderfully multi-faceted, carefully tailored to her needs, and comprehensively transformative for her professional development. The ROSL Arts programs, under the leadership of Geoff Parkin, are very impressive indeed. And much credit goes to Elizabeth Murray, president of the BC ROSL chapter, and to local members, for creating this wonderful opportunity for UBC Music students!" In addition, Cooke received complimentary tickets to attend some of the finest concerts of the season, including a BBC Proms at Royal Albert Hall, featuring a new work by Mark Simpson. How has the ROSL UK Scholarship for a BC Emerging Musician supported your learning as a doctor of musical arts (DMA) candidate and prepared you for a career after graduation? Going to the UK as a BC Emerging Musician contributed to my confidence as a performer, my awareness of the greater musical world, and my development as an artist. As a DMA candidate in oboe performance, I have spent the last several years refining my playing while deepening my understanding of my instrument in a historical and cultural context. I gained a greater appreciation for the history of classical music; it’s one thing to read a textbook and quite another to stand in the church frequented by Handel! I made connections that I hope to maintain with colleagues from 70 different countries. Most of all, I was reminded that art has the ability to cross the borders of countries, languages, beliefs, and even time to bring the world closer together. What was the most memorable experience from the tour? My most memorable moment was warming up before my final recital of the tour at St. Martin-in-the-Fields church. I was nervous for this performance: it would be my biggest audience by far, and the venue was so iconic (St Martin’s is a popular tourist destination and a big name in the classical music world, famous for its acoustics, architecture and central location in Trafalgar Square). As I ran through the repertoire with fellow ROSL scholars, people from all over the world began filtering in. I was struck, in that moment, by the absolute beauty of what we do as musicians. It’s easy to forget, given the often competitive nature of our field and the solitary hours spent in the practice room, but the main point of all of this is to connect with our shared humanity. It was this connection that I felt at St. Martin’s that day, and I hope to remember it as I go forward in my career. I would first and foremost like to thank the BC chapter of the Royal Over-Seas League, and in particular Elizabeth Murray, president of ROSL’s BC branch, for starting this excellent scholarship program. I’m also grateful for the ROSL ARTS team in London. They were the primary organizing force behind my visit. I felt warmly welcomed at every stage of the trip, from offers of concert tickets to suggestions of what to eat in Scotland! Finally, a big thank you to Dr. Richard Kurth, director of the UBC School of Music, for helping to bring this opportunity to UBC performers. I sincerely hope that the UBC-ROSL relationship can continue for many years in the future. Auditions for the 2018 Royal Over-Seas UK scholarship happen on Jan. 20th, 2018. They are open to the public. To learn more about ROSL, visit https://www.rosl.org.uk/rosl-arts. On Nov. 10th, renowned pianist and Professor Emeritus Robert Silverman performed Beethoven’s Piano Concerto No. 5 in E flat major, Op. 73 with the UBC Symphony Orchestra to a packed house at the Chan Centre for the Performing Arts. Silverman, who first studied the Beethoven concerto as a student nearly 50 years ago, brought a lifetime of knowledge and accomplishment — and a continued sense of wonder — to the legendary work. And it showed. For Silverman, the “Emperor” — as the concerto is popularly known — has lost none of its freshness and excitement. If anything, his appreciation of the concerto has deepened over years of studying, teaching, and performing. There was a time, however, when Silverman could only dream of mastering a concerto like the “Emperor,” let alone performing with a symphony orchestra. Though he played piano throughout his childhood and youth, his parents never encouraged him to pursue music professionally. Instead, Silverman studied engineering at McGill and arts at Concordia. Making a living as a pianist seemed to be out of the question. Even after he dropped out of engineering and headed to the Vienna Academy of Music to study piano, Silverman was unsure of the career possibilities that lay ahead. One day, he brought up the dilemma to his friend – what were they supposed to do once they returned to North America? “It was around then, in the early 1950s, that Silverman’s future alma mater, the Eastman School of Music launched its groundbreaking-at-the-time Doctorate of Musical Arts degree.” For the first time, musicians could graduate from school with hopes of obtaining a position at a university that would allow them to both teach and perform. That is not to say that Silverman didn’t face any competition at all. While at the Vienna Academy, he studied in the same class as future luminaries such as Mitsuko Uchida, known today for her interpretations of Mozart, Beethoven, Schubert, and Schumann. He remembers being daunted by the much younger virtuoso (she was 13, he was in his twenties). Still, he persevered and returned to North America with a newfound sense of purpose. At Eastman Silverman studied with Cecile Genhart and Leonard Shure, the former assistant to Artur Schnabel, one of the great pianists of the 20th century. He absorbed the philosophies of both Genhart and Shure, who influenced him in different but significant ways. Genhart was all about “polishing and listening, getting the nitty gritty of it.” Shure, on the other hand, taught him how to play Beethoven in a way that stood out from other pianists. He remembers a masterclass that Shure gave on the piano sonatas as a life-changing experience. He also studied the “Emperor” concerto under Shure’s guidance. It was these teachers who impressed upon him the value of a diverse and varied musical education — something that informed his own approach to teaching. One thing Silverman firmly believes is that all serious piano students, regardless of their teacher, should have the chance to play with a symphony orchestra. And so, the Robert and Ellen Silverman Piano Concerto Competition was born. Open to all UBC School of Music piano students, the first competition takes place in March 2018 and will run every two years thereafter. The grand prize? An opportunity to perform a concerto with the UBC Symphony Orchestra at the Chan Centre. “[Maestro] Jonathan Girard is a great guy and a fabulous conductor. He doesn’t only conduct what he wants, but also considers the students’ needs,” Silverman says. Learn more about the Robert and Ellen Silverman Piano Concerto Competition. On April 8th, 2017, the UBC School of Music celebrates the 20th anniversary of the Chan Centre for the Performing Arts with a special performance of Mozart’s Requiem and Dr. Stephen Chatman’s A Song of Joys, featuring UBC Choirs and Symphony Orchestra. The concert will be broadcast live on CBC Music at 8 p.m. PT / 11 p.m. EST as well. Designed by renowned Vancouver architect Bing Thom, D.Litt. Honoris Causa (UBC), the Chan Centre is recognized as one of Canada’s premier musical venues thanks to its bold architecture and state-of-the-art acoustics. Over the past two decades it has also become an important launching pad for ambitious and talented student musicians. “Without question, the Chan Centre experience is at the heart of our learning and artistic enterprise for everyone in the School. With this celebratory concert we want to thank the Chan family for their extraordinary vision and generosity, and to showcase the abundant talents of our students,” says Dr. Richard Kurth, Director of the UBC School of Music. For percussionist and M.Mus. student Julia Chien, performing at the Chan Centre is exciting — and a little terrifying. “It’s such a privilege. I’m always challenged beyond the limits of what I think I am capable of!” she says. Chien will perform the timpani solo in A Song of Joys. Dozens of UBC Music students have parlayed their experiences at the Chan into exciting careers. Baritone Tyler Duncan (BMus ’98) credits the Chan with setting the stage (so to speak) for a life in music that has taken him around the world, with stints at the Metropolitan Opera, Toronto Symphony Orchestra, New York Philharmonic, and Carnegie Hall. “I remember singing in the choir [at the inaugural concert] and being in awe of the amazing acoustics. I walked across that stage to receive my Bachelor of Music degree and one of my first professional jobs as a singer with Early Music Vancouver was there… the Chan feels like home to me,” Duncan says. Other notable alumni include Cynthia Yeh, principal percussionist with the Chicago Symphony Orchestra, soprano Shirin Eskandani, who this year made her debut with the Met in Carmen, cellist Luke Kim of the Vancouver Symphony Orchestra, and up-and-coming pianist Bogdan Dulu. The Song of Joys concert features the next generation of incredible student musicians performing under the direction of School of Music conducting faculty Dr. Graeme Langager and Dr. Jonathan Girard. The concert is dedicated to the memory of Bing Thom, who passed away suddenly in 2016. Thom’s vision and his attention to acoustic detail — he was an amateur musician, and an aspiring conductor before he decided to pursue architecture — are what made the Chan Centre the world-class facility it is today. Visit http://music.ubc.ca/song-of-joys to read more about the anniversary concert and the history of the Chan Centre, including memories from School of Music faculty and alumni. Congratulations to Alexander Weimann, Turning Point Ensemble and Musica Intima on their Juno nominations! Weimann is the Principal Artist and Director of our Baroque Orchestra Mentorship Program. He’s nominated for Classical Album of the Year: Vocal or Choral Performance with Bach: Magnificat BWV 243, his recording with Arion Baroque Orchestre. Turning Point Ensemble and Musica Intima are nominated for Classical Composition of the Year for their recording of Ana Sokolović’s “And I need a room to receive five thousand people with raised glasses…or…what a glorious day, the birds are singing ‘halleluia.’” The song appears on the new album Thirst, a collaboration between the two groups released by Redshift Records. Karen Wilson (BMus’74) produced the album. Will Howie (BMus’04) was the recording engineer and digital editor. The Juno Awards will be announced on Sunday, April 2nd. We're keeping our fingers crossed! "And I need room to receive five thousand people..."